College-bound students in the Tutor Corps program at Guadalupe Center, a nonprofit organization focused on breaking the cycle of poverty through education for the children of Immokalee, invite the community to join a lunchtime fundraising event on Saturday, Feb. 3 at Carrabba’s Italian Grill, located at 4320 Tamiami Trail N. in Naples. Funds raised during the event will support a special end-of-year celebration for Tutor Corps students at Busch Gardens in Tampa. The fundraising event will offer two seating options, beginning at 11:30 a.m. or 12:45 p.m., and car-side carryout is also available. With lunch served by Guadalupe Center’s Tutor Corps students, the menu includes chicken marsala, penne pomodoro, Caesar salad and a non-alcoholic beverage. A cash bar is also available. Tickets are $20 per person, and a portion of the ticket sales and all generous tips will go to the students’ fundraising efforts. Seats can be reserved by visiting https://secure.acceptiva.com/?cst=0d7c9f, or by contacting Sheila Oxx at soxx@guadalupecenter.org or 239-657-7133. 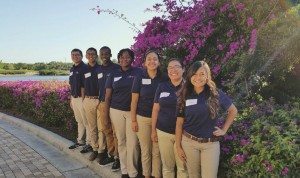 Guadalupe Center’s Tutor Corps program works to keep Immokalee’s teens in school, removes the barriers to higher education and ensure that students ultimately graduate from college with the tools to be successful in life. The program is currently helping more than 100 students to overcome economic and environmental circumstances in order to break the cycle of poverty. To learn more about the program, visit www.GuadalupeCenter.org. Guadalupe Center is a purpose-driven, nonprofit organization with proven results in creating endless possibilities for the students of Immokalee through education and fostering personal and academic success that leads to economic independence. With a focus on breaking the cycle of poverty through education, Guadalupe Center is proud of the children’s accomplishments: 94% exceed kindergarten readiness measures, 100% of Tutor Corps high school seniors graduate high school and are accepted into college, and more than 90% graduated with a post-secondary degree.